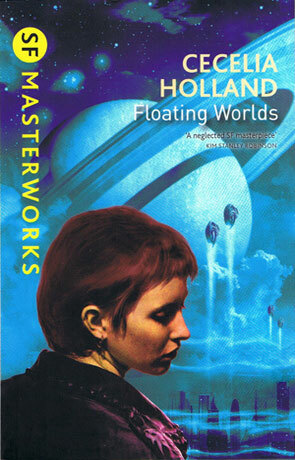 The only science fiction novel that the immensely talented Cecelia Holland has written, Floating Worlds is taking it's rightful place within the halls of Gollancz SF Masterworks collection. The novel tells the story of humanity 2000 years in the future where capitalism has been overthrown and anarchy reins supreme as not only a legitimate political ideology but actually practiced throughout the world. Having Colonised some of the planets in the solar system including Moon and Mars they have encountered problems with the Styths, a powerful mutant race who have descended from early pioneers and live in the outer gas planets Uranus and Saturn. They have been launching pirate raids on ships from Mars and are becoming increasingly hostile. Earth's "Committee for the Revolution" as been asked to step in and negotiate a truce between the middle planets (Earth and Mars) and the Styth Empire. It must be said that Floating Worlds is quite a thick tome, weighing in at 640 pages it's certainly no shrinking violet and that can also be said of the prose too. With a simple, fast and uncluttered narrative the pace is thankfully pretty fast but does take a little getting used to; having sometimes short clipped sentences. This extends to the backdrop too; a world that has accepted anarchy rather than a structured government is so different - so antipodean to most novels that are out there, or at least those that work anyway. This unrestrained reality is set a full 4000 years in the future, a post-nuclear Earth where people live in large domes, sheltered from the surrounding radioactive wastelands. The colonies on Mars are ultra capitalist and the Moon ultra fascist which act as very effective counterpoints to Earth's nonconformist, bohemian culture. The lead character of Paula Mendoza is seen at first glance as a clichéd "gentle woman standing up against a male dominated society" and that certainly is one of the many messages but there is so much more going on, and it's all done in such an intelligent and thoughtful manner that overcomes such shallow judgments. I loved the way that Paula thinks, if anything she seems to manage to embody a true anarchy, not some violent misconception that is so often portrayed but one of simply not conforming, representing an ultimate level of freedom - which reminds me of the quote by Alan Dean Foster - "Freedom is just Chaos, with better lighting.". The race of the Styph are represented as a brutal, sexist aggressive race who treat women as little more than slaves and slaves as little more than animals. They raid the inner planets and colonies stealing resources and taking people as a slave-force. Paula is tasked with trying to arrange a treaty with these 8 feet tall clawed people and she does so in a totally unexpected and quite brilliant way (which I won't mention for fear of spoiling the story). There is a major theme of race and sexism running throughout - explored without judgment and represented in a thoughtful and intelligent manner. The story is both vast in scope and astounding in it's vision, spanning 17 years and making most of the different ideas and themes, everything is just so plausible and vivid; the dialogue gripping so that those 600 plus pages don't seem like much at all. The style is very different to most science fiction books you will read that it's an experience in itself, there isn't any over-flowery descriptions, no lengthy exposition just a gritty, believable story that deals with some very real issues. This is one book that stays with you long after you have read the final page and lovingly placed it one your shelf; I applaud Gollancz for making sure it remains in print. Written on 20th January 2012 by Ant.